Was looking at Roberts, but didnt look that consistent. so went for Isak instead. He looks like a joke player! Have to assume he's the researcher, and pumped all his "points" into certain stats without thinking about how it would end up. I think it's more the researcher's idea of a joke. In the database his shirt name is "Wankah", and his attributes are even more extreme, and not in a good way. 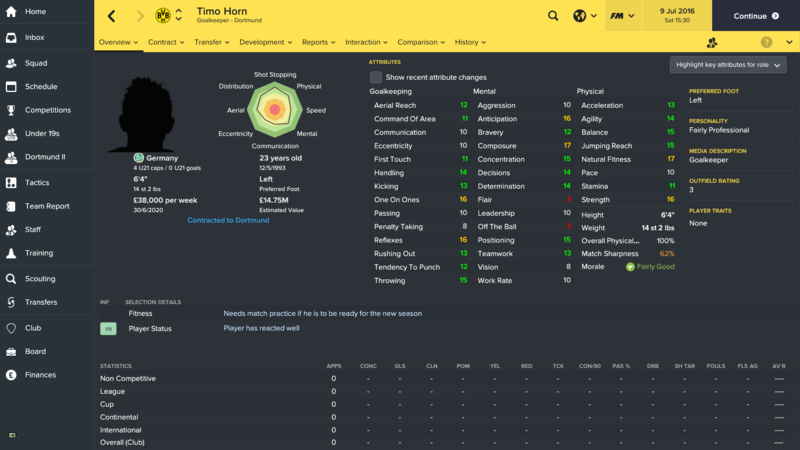 Timo Horn still has a transfer clause of £7.75m at the start of the game, btw. Edited November 19, 2016 by RandomGuy. Superlative name and a great looking player too. Screenshot is taken at the end of season one. No idea what sort of price you'd be looking at as even after just winning the Championship with Sheffield Wednesday my scouts say he has no interest in joining me and Vitesse don't want to sell. Any gems for Hibernian - Scottish Championship level, lads? Lewis Vaughan at Raith generally turns into a Scottish Premiership standard forward in my saves. What the actual hell! As I'm Swedish I can understand Norwegian pretty good and I managed to find Sogne's (his club) squad and he's not there. Is this some kind of sick joke from the researcher? There's quite a few others with weird attribute distributions that aren't in Sogne's first team. I think it's an in-joke between friends. I think it's a pretty disgusting joke as it says in your link that Anders Tviberg Fladstad, born 18th April 1995 (both name and date of birth exactly the same as in FM like you mentioned) and died 20th August 2012 under tragic circumstances. I have made a shortlist with a number of cheap players and players who will be valued more once they are at your club, it's suitable from league 2 to the EPL. Ali Maaloul - Not a world beater by any means, but great stats on an experienced Left wing-back who is very cheap from Al-Ahly in Egypt. I was able to get him to move to Minnesota FC in the MLS for 475K, so you should be able to get him to move literally ANYWHERE else. I got a wp for Ahmed Tawfik in the first January window with Aston Villa. He bagged a couple of international call-ups for Egypt and then it's was no worries. Hoping he can make a difference for my vulnerable and unbalanced midfield atm. A wing back with 17 finishing? Haven't seen this kid mentioned yet, he looks very promising, The screenshots are from start of second season: 15 determination, passing, technique, and vision. 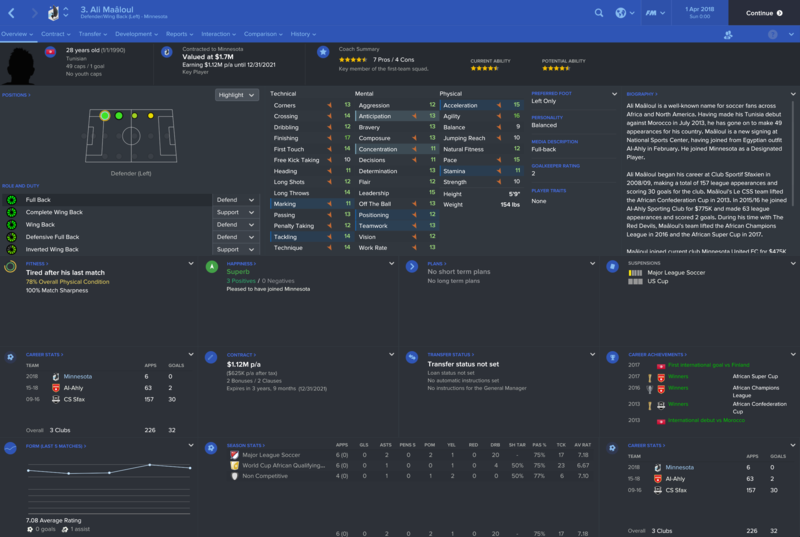 His stats here look very similar to Bentancur's at age 18, with the same potential rating in my save. Looking forward to see how he develops! Was searching for a player similar to Ozyakup after missing out on him and glad I did. 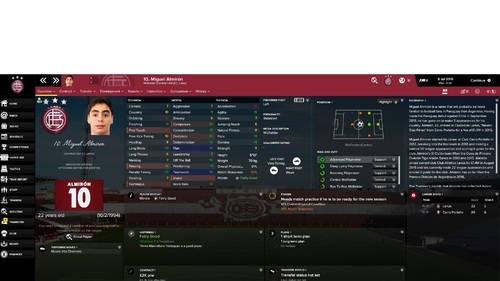 Found Miguel Almiron available for 10m less and just as good. Able to pick him up for 3.5m and he gets a WP on appeal. Edit: No idea what happened to that screenshot but never mind. To be fair, Ali Maaloul apparently scored 16 league goals last season, which is pretty impressive if he was mostly playing at wing back. looks quite handy without the finishing stat. You mean load the players? You're trying to load the league which isn't there... load the area or country. Personally, I have all national rep level players loaded from every continent... ensures I get any players from those areas that would interest me. 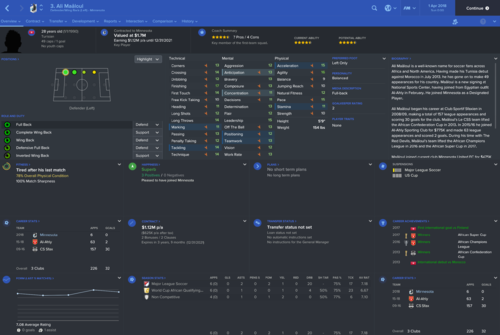 Simunovic looks like a lot of player for £1.2m. 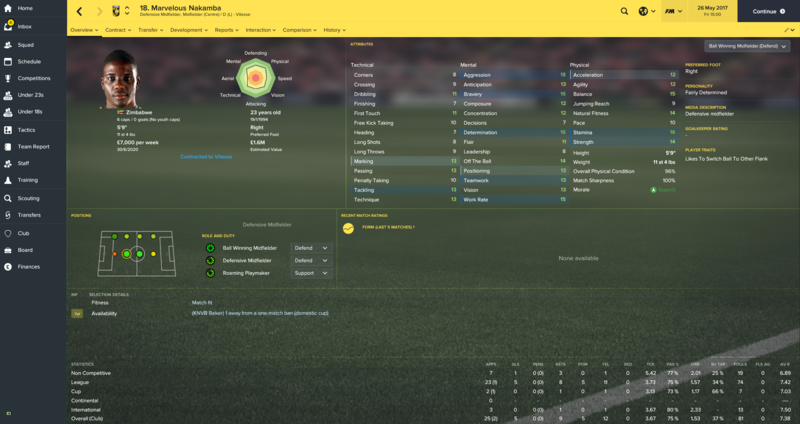 I brought in Phillip Lienhart on loan from Real Madrid. Started every game nearly for me at Werder Bremen. Not the greatest of stats but he was really solid. Also perhaps more well known but Kevin Lasagna from Carpi is a really good false nine. Scored 64 goals so far in 59 games. Very cheap too. A king in his sand-box, but not beyond. I'm looking for some players willing to join Ferencvaros. Got an ageing starting XI and no decent youth players coming through. Isaac Layne was phenomenal for me at Stirling Albion from Scottish League 2 through to the Scottish Championship where he has scored easily consistently. 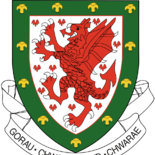 I would have kept him had I been promoted to the Scottish Premiership but I accepted a job offer from Wigan. 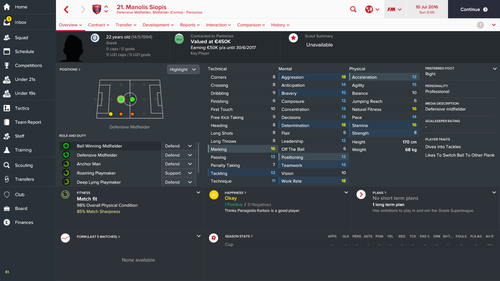 Best played as a poacher but is quite versatile up front. 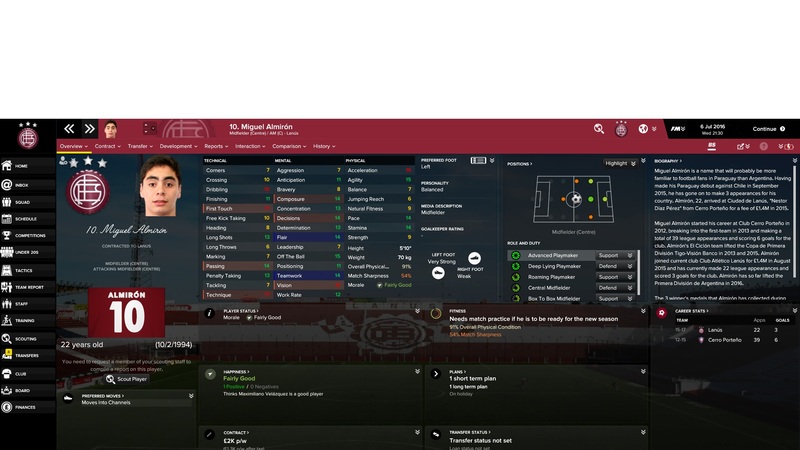 Got him on Loan from Alloa Athletic initially then bough him outright for £9k and he only wants a few hundred in wages each week - keep in mind Stirling Albion are a semi-pro club. Available for between £2.8m and £4.4m at the start of the second season, had 21 goals and 3 assists last season, looks decent, never used him myself though, debating whether to buy him or not, only thing that's not really appealing to me at the moment is the dwells on ball PPM. 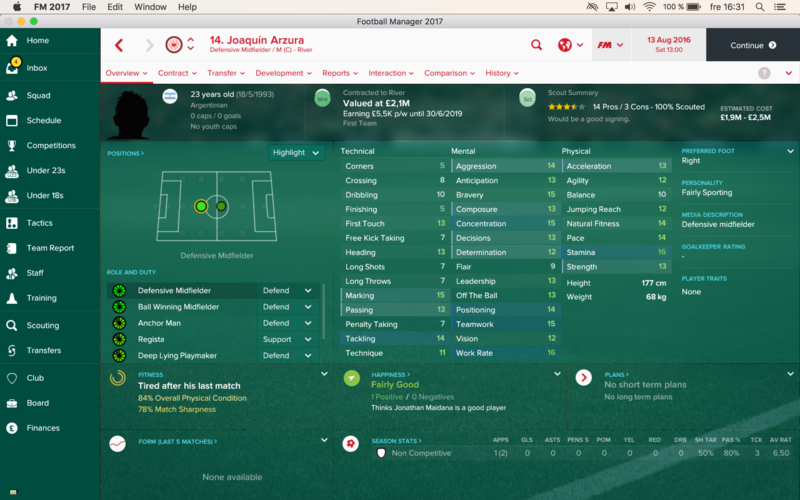 Found a solid and cheap Argentinian defensive midfielder. Available £1,9 - £2,5m, cheap wages and he'll get a work permit. My scouting report also says he's a fairly consistent player and enjoys big matches. Imo, he could be a key player for many sides at the mid table and below in PL and a good backup for the top half. December 2020 and Atakan Akkaynak is up for World Young Player. I've never heard of him before. I wonder if you can get him cheaper earlier on. Starts at Leverkusen and Roma purchased him in 2018/2019 for £18million. I feel like I've missed something that I've never heard of him. He looks insane. Leeds, first window ...200k...4-5 star potential. 600k ... raw, but a season in the championship will let him find his feet I think.